Welcome to Morocco! Upon arrival at the Fes International Airport, you will be met by an English speaking tour guide and transferred by shuttle bus to Rabat, the capital city of Morocco and residence of the King. In the afternoon, play the Dar Es Salaam Royal Golf Course which is ranked in Golf Magazine as one of the top 100 courses in the world. The Red Course will particularly challenge and delight you. After an early breakfast, you will venture out to the ancient Roman ruins of Volubilis. The group will spend the morning exploring this 2000-year-old city. Lunch will be taken in Meknes. After lunch your guide will take you for nine holes in the ancient medina of Meknes. You will then continue directly to Fes and lodge at one of Fes’s quality hotels. Grab your clubs as today’s golf outing is at the Fes Royal Golf Course. 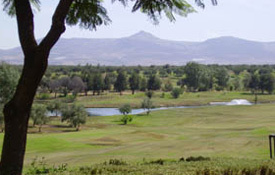 Situated among countryside olive groves at the foot of the Middle Atlas Mountains, the course is characterized by undulating fairways and sloping greens. Play in the morning and depending on time, take some time in the early afternoon for souvenir shopping back in the ancient city. Depart for home from the Fes International Airport.